Bass Wheel is a novelty game. Players step up and pull the handle to spin the big wheel. When the wheel stops, players are rewarded with tickets. 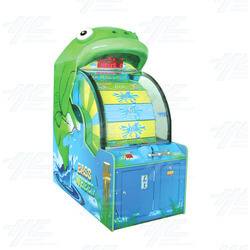 Players can win up to 1000 tickets for a perfect spin with the Big Bass Bonus. The cabinet is very eye-catching, with the wheel partially coming out of the mouth of the giant bass. Bass Wheel also comes a screen displaying fishing bloopers, dual ticket dispensers, high capacity ticket trays, and easy to navigate operator menu and a built in performance tracking system. Bass Wheel is a novelty game. Players step up and pull the handle to spin the big wheel. When the wheel stops, players are rewarded with tickets. Players can win up to 1000 tickets for a perfect spin with the Big Bass Bonus. The cabinet is very eye-catching, with the wheel partially coming out of the mouth of the giant bass. Bass Wheel also comes a screen displaying fishing bloopers, dual ticket dispensers, high capacity ticket trays, and easy to navigate operator menu and a built in performance tracking system. Reel in the Fun with Big Bass Wheel from Baytek! Players step up and pull the handle to spin the big wheel. When the wheel stops, players are rewarded with tickets. For an even bigger catch, a Big Bass Bonus has been added where players can win up to 1000 tickets for a perfect spin! The Pro version is 30% smaller then the original series. The Big Bass Wheel series gives you the chance to win big, and all you have to do is pull the lever!